Arkham House, 1960; 168 pp. ; limited to 1500 copies. First Edition. 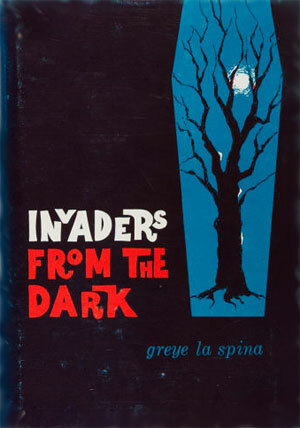 Invaders from the Dark is a horror novel by author Greye La Spina. It was La Spina's first and only hardcover book. The novel was originally serialized in Weird Tales magazine. It appeared in the April, May and June, 1925 issues. The story is set in Brooklyn, New York in the mid-1920s and deals with the widow of an Occultist, Portia Differdale, and Princess Tchernova, a wealthy and beautiful Russian werewolf. Both women desire the same man, Owen Edwardes. Book is solid and clean; black binding cloth is clean and shiny; gilt lettering on spine is shiny but slightly worn; pages are clean and bright. Dust jacket front is clean, bright; some rubbing is present, along with very minor some wear at top and bottom of spine and at top and bottom of front fold; flaps are clean and bright with original price ($3.50) unclipped; very light sun fading on spine; rear cover is clean and bright. Overall, this is a fine copy of the book in a nearly fine dust jacket.